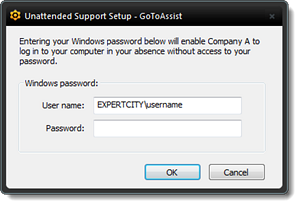 Once you have saved GoToAssist.exe, setup will complete automatically. You will likely see an orange daisy icon in your system tray/Finder toolbar (you may need to use the upward arrow to expand your tray if the icon is not visible) and a message bubble indicating that support has been completed. Newer versions of GoToAssist will have an orange triangle symbol instead. In the window that pops up, enter the Windows User name and Password which we will be using on this machine. This is important - our technicians will likely be accessing the machine while your office is closed, and we will be unable to fully connect without these credentials. Click OK to confirm. Installation is complete! A confirmation message will appear letting you know that the password has been successfully stored. Please e-mail our technicians at forms@proquotes.net to let them know that your connection is ready to go. If your computer is set to hibernate or power down after a certain period of time, please disable this feature! Our technicians are unable to access machines which are not powered on.